I love it when historical films deviate a bit from their usual formats to offer something a little more than typical wars, scheming royals, or assassination attempts, etc. You get my drift. Detective K: Secret of the Lost Island is one of those films that is simply clever by meshing together a fusion of things to provide something new but not entirely unfamiliar to audiences. Its subject matter we've seen but not exactly together in historical films. The elements this movie utilizes usually don't work or either flop especially in dramas so they've figured out the right formula considering the success of the Detective K series. I'm a sucker when it comes to detective movies and shows but I'm doomed when a film like Detective K: Secret of the Lost Island gives me comedy that is perfectly timed while staying true to being a historical. My initial reaction was one of pleasant surprise since I wasn't expecting to be fully engrossed. Now I have high expectations and anticipate further films to be added onto the franchise if the script continues to provide clever stories. It's about a bumbling scholar and nobleman, Kim Min (Kim Myung Min) whose Joseon's top detective. He attempts to track down the source of counterfeit silver that's been circulating around, resulting in mass money laundering while simultaneously searching for a lost girl. The two cases seem unrelated but through his investigation, he'll uncover facts that reveal how they intersect, unraveling the secrets of a lost island. 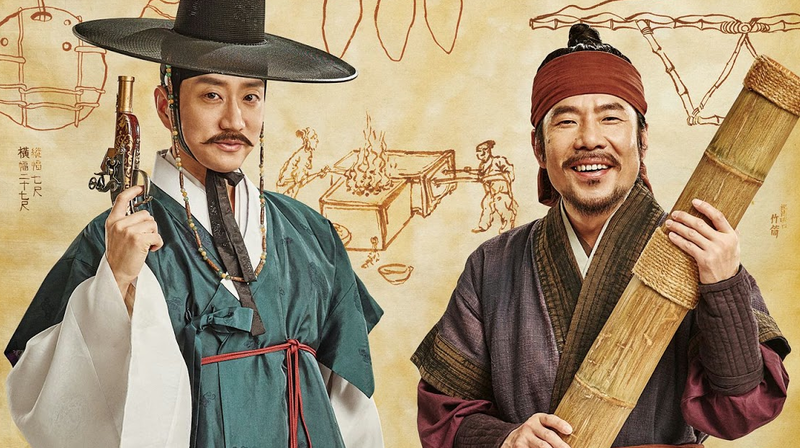 With his trusty companion Seo Pil (Oh Dal Su) the movie provides laughs, a historical take on bromance and friendship, and a witty script that provides a solid mystery story. As a spectator, you'll want to try and connect the dots; for me that's the best kind of mystery film, one that has me putting my brain to use instead of giving me all the information, simply having me point fingers at the criminal. Guessing games give a certain kind of thrill, a unique aspect attributed to crime and mystery. If I had to make a comparison to further explain things, I'd sum it up as being similar to Detective Dee but more fun and light with less action, and not as grand scale either. What makes Detective K a good watch is the comedy or maybe Kim Myung Min's moustache? I'm starting to think Korean historical films that explore comedy tend to lean towards action or mystery as the overarching theme in order to sell something worthwhile to audiences and it appeals to me very much - that's my cup of tea. Detective K: Secret of the Lost Island is the 2nd film within the franchise - The Secret of the Virtuous Widow is the first film so if you're a stickler for order then I recommend watching the first film since the movie simply dives right into the story, the characters already established. I will confess that I enjoyed the first film far more than this one but it's still good, maybe not as great (sequels usually never outshine the original).